A strange language, a new culture, a different currency… arriving in a foreign country can be daunting. But finding unique gifts and engaging with locals is all part of a great travel experience. 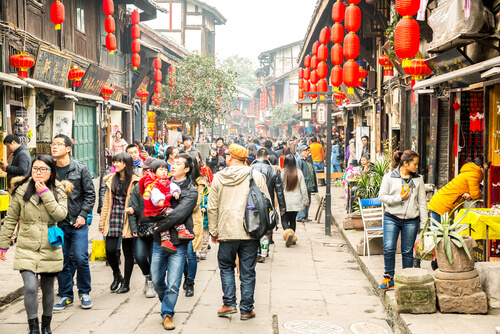 Culturally in China, haggling and negotiating on price is not only acceptable – it’s expected. Someone ‘driving a hard bargain’ is actually seen as someone smart and to be treated with respect rather than someone who is just ‘cheap.’ Outside of the largest department stores, the price of every transaction can be ‘discussed.’ Not every discussion will result in a discount but you’ll be surprised at how many do. Because of this, sellers artificially inflate prices in China so if you don’t haggle, you’ll be paying over the odds in many cases. It may sound like a lot to take in, but a smile and a request, pianyi yidian (to lower the price a little), is often enough to do the trick. The key thing to remember is to haggle before you engage in any service or use any product. 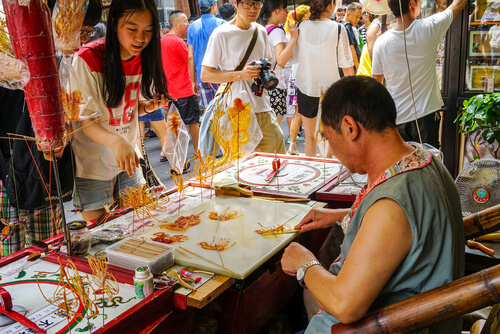 After you’ve taken that rickshaw journey or eaten those bowl of noodles, the vendor can determine the price and there’s not a lot you can do about it. Thanks to this style of pre-negotiating for products and services, tips are never expected in China. In fact, tips are often refused. Sometimes seen as patronising or charity, a self-respecting Chinese person would rarely take a tip. Furthermore, in some local restaurants, where the staff is searched at the end of their shift, they could be accused of theft if found with extra money. In western-style restaurants or high-end hotels and bars, tipping will be treated in a similar way to other western countries. A few RMB for a bell boy delivering room services or finding you a cab is perfectly acceptable. It’s worth noting that where tips are expected, they are usually included as a standard addition (usually 12%) to the bill. So always check the bill in a restaurant before adding a further tip. If someone has gone above and beyond then a tip is perfectly ok. A tour guide who has done a great job or a taxi driver who has raced you to the airport on time will both be over the moon with some extra xiaofei or pocket money. If this is fun for you then it’s probably fun for them too. As soon as it becomes nasty or, if you insult the vendor or their products, then you’ve lost and you’re not going to get a deal. Keep smiling throughout the experience and whether you buy the product or not, you’ll still have a fun time. Many people who come to China think they are being ripped off but more often than not, sellers are just starting high so they have room to manoeuvre. A driver might offer a ride for RMB400 but a friendly smile and an offer of RMB100 may well do the trick. In China, it’s tradition to ask for (and mostly give) a discount. As mentioned, sellers will usually start negotiating at an overly high price, expecting it to be reduced in the haggling process. So don’t feel awkward about going in very low. It isn’t offensive to offer just 10% of what they are asking for. If you’re not sure, ask the vendor to make it cheaper and see how quickly they reduce the price. It is sometimes only when you’re ready to walk away from the deal you discover how low they are really ready to go. ….and don’t get bamboozled by currency conversions midway through negotiations. Have a maximum price in mind before you start the battle. A tailored shirt is a bargain at $20 but perhaps less so at $100. Could you get better quality for a lower price at home? Buying four items from one seller means you’ll get a better deal and will help you negotiate a much better price than buying one item from four sellers. Ask them about themselves, tell them who you are buying gifts for and show them you’re human. Chinese people are very family-orientated and helpful to those they perceive as friends. You’ll certainly get a better price if they like you. On the other hand, don’t be nervous if they play offended. It isn’t uncommon to hear phrases such as: “At that price, I lose money,” or “you’re stealing from me.” This is just a tactic they use. Remember, they will never sell at a loss. If you saw a RMB10 note exchange hands for a bunch of grapes, then you’ve got a rough idea of what you should be paying - knowing this will help enormously. Don’t expect to always get it as cheap as the locals because you haven’t built that relationship with the vendor, but it’s a good place to get a starting price. Enjoy haggling. It’s not a competition but should be an enjoyable experience. If it stops being enjoyable then simply walk away – there will be someone else selling something similar a few stalls down. Vintage markets, antique shops, food stalls and boutique stores – all places you can try out your bargaining skills. If there is no labelled price, then this is an invitation to let the games begin. Even with labelled prices, these are guidelines rather than set-in-stone prices. Services are also open for negotiation. Hiring a car and driver for a day or, a guide to take you hiking is also an open conversation. Large department stores, supermarkets and global chains are unlikely to offer much of a discount. However, it’s doesn’t hurt to ask. Many luxury stores provide a sales commission to their staff and some might be willing to reduce the price a little if it means making their targets. Likewise, many larger hotels will have standard rates but smaller hotels and privately run places will often provide a discount if it’s the difference between a sale and an empty room.